The demo called by ADEDY, the public sector umbrella union, and GSEE, the private sector umbrella union, started gathering at 12:30 in Syntagma square, after another 10,000 strong demo by Communist Party umbrella union, PAME had ended its own demo and marched to Omonoia square. Soon around 10,000 people gathered in Syntagma, a large number considering there is only a 4 hour stoppage and not a strike today. All was quiet until the GSEE union boss Mr Panagopoulos took the microphone to address the protest. Before managing to utter more than five words, the hated union boss was attacked by all kinds of protestors who first heckled him and threw bottles of water and yogurt on his face and then attacked him physically like a giant swarm. With bruises, cuts and his clothes torn, the PASOK lackey struggled his way towards police lines, as the people attacked again and again. Finally he managed to hide behind the Presidential Guard and up the steps of the Parliament where the hated austerity measures were being voted. The crowd below encouraged him to go where he belongs, to the lair of thieves, murderers and liars. Soon after the beating of Panagopoulos, small skirmishes started between protesters and riot police forces in the form of body-to-body battles in front of the Parliament. 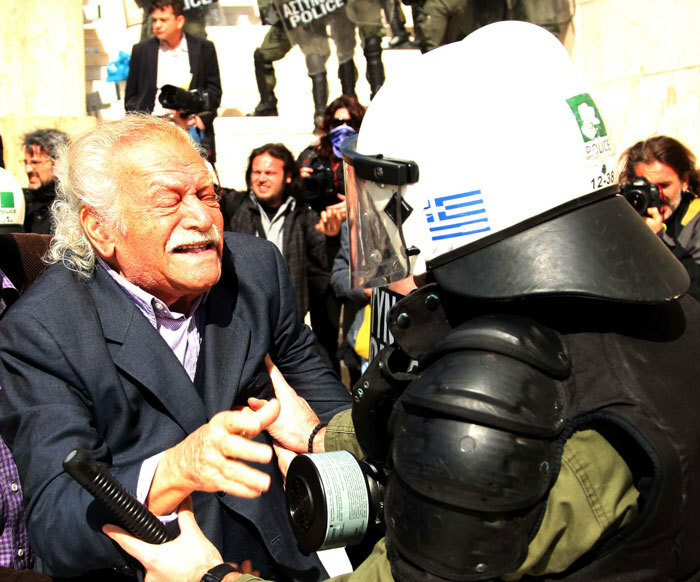 During one of these incidents, riot cops attacked Manolis Glezos, the heroic anti-nazi resistance fighter who had lowered the nazi flag from the Acropolis during the german occupation. The elderly man was trying to help a man from being arrested at them time and had to be removed from the battle scene in an ambulance as tear gas fired directly on his face caused him serious pneumonic problems and he remains in serious condition in hospital (for a video of the attack see http://www.youtube.com/watch?v=6FX3S3I7Nos&feature=player_embedded). The attack on Glezos gave the signal for a general attack of thousands of people against the cops, many of who were wounded during the battles which included rocks, sticks but no molotov cocktails. During the clashes 5 people were arrested, 2 of who are accused under the anti-hood law, while the rest with small non-criminal breaches of the law. During the clashes many riot shields and helmets were taken from the cops and burned along with other flaming barricades on the streets. 7 cops are reported by the police as heavily wounded, some with knee-cap and other bone breaks. Due to extended use of tear gas at around 14:00 the atmosphere in Syntagma square was so unbearable that among chanting "the cops are not the children of the workers, they are the dogs of the bosses", the demo turned into a protest march with the direction of the Ministry of Labour, half a km south of Omonoia square. At reaching Propylea more clashes with the police took place, while a sole high-ranking cop was isolated and beaten by the crowd. Further down on the way to Omonoia, protesters attacked a riot police squad that was guarding the National Legal Council. The riot police squad was cornered and attacked by means of sticks rocks and flares, before being forced to retreat inside the building after one of its members was captured by protesters and repeatedly trampled by the angered crowd. The march then continued to Omonoia and from there down Peireaos street where banks, economic targets and expensive cars came under attack, before the march reached the Ministry and the protesters tried to break its central doors. More clashes with the police ensued and the march turned back to front and decided to march once again to the Parliament. On the way, cops came once again under attack by protesters with many riot policemen wounded and retaliating by means of tear gas. After reaching the Parliament, the march refused to desolve and took once again to the street in a bravado of resolve, until it reached Propylea where it came to an end. After the end of the march 6 more people were detained while taking refuge to the Social Security Headquarters, but have been released without any charges against them. In Salonica, upon reaching the gates of the Ministry of Thrace and Macedonia protesters pulled down the heavy iron fences of the Ministry and moved into its front yard where they were confronted by riot police who made use of tear gas amongst flaming barricades. Finally, the workers of the National Printing Units have occupied the premises and refuse to print the legislation imposing the austerity measures. Unless the legislation is printed there, it is not legally valid. Meanwhile the occupation of the State General Accountancy by layed-off Olympic Airways workers continues. The workers have also permanently closed off Panepistimiou street (the equivalent of Oxford street in London), at the heigh of the building, with all traffic diverted by side-roads. A general strike by ADEDY and GSEE has been called for March 11. Thanks for all this info. As I'm regularly writing about Geek events, I have a question: what exactly is making people so very angry with this trade union bureaucrat? I know -and agree with - the general argument about trade union leaders as such, but I'm wondering, whay is this man especially hated? Examples of scandalous sell-outs maybe? I believe the already existing anger against the class of trade union bureaucrats has been further fueled in the last few weeks because of the lukewarm attitude of ADEDY and GSEE towards the measures. Middle and low income people in greece face extreme poverty due to the measures, but Mr Panagopoulos cannot make up his mind to call for a serious trade union struggle against them (such as week long general strikes etc). Also after the announcement of the first set of measures in mid February he was seen visiting the PM in his Mansion but when asked if they discussed the measures, he replied, no, he was visiting the PM as a PASOK member. All in all GSEE presidents are considered to be PASOK running dogs, rewarded for their services to the party with a seat in parliament after finishing their office as GSEE chiefs. Also, this is the time where the State might very likely either manipualte a horrible terrorist attack - like in Italy in the 60s and 70s - from , say, "The Sect of Revolutionaries" or whatever - or let a bomb planted by more 'libertarian' sections explode and kill innocent proletarians by ignoring bomb warnings or arriving too late - this is what could happen if you rely on the State or the media to inform people of (self-defeating) bomb attacks. Regardless of whether anybody wants to discuss this here, this is something they should be discussing amongst themselves. Also, isn't this attack on a hero of the resistance going to weaken that aspect of the strategy of the State that presents all this in a nationalist light, as something they are forced to impose because of those horrible nazi Germans in the European Union...? I guess some cop heads might roll (not literally, sadly), no? - the most important question that comes to mind is - what flavour yoghurt? Gooseberry, perhaps? (I'm sure there are more appropriate flavours, but - sorry - that's the best I can think of for the moment). I'm sure it would have been Greek natural yoghurt. Scroll down to the bottom fora video some greeks burning the ballicks out of an EU flag. - from everything I've heard, we're quite a bit of distance from that, though in certain intense moments vast canyons can be leapt across. But we should keep an eye on how other union bureaucrats and union structures are recuperating or going to recuperate some of the anger. (taxikipali has already begun to outline some of that, and he knows al ot more than anyone excited by these events at a distance). Let's just ask pertinent questions for the moment, before leaping to conclusions that are not at all evident so far. exactly. It is a good sign, however, as in this country, most people tend to see these things as problems of leadership, in terms of they have a bad, compromised leadership of the unions, as opposed to seeing the problem is being that of the concept of leadership and the unions as a whole. Both theoretically and as an eye witness, I do not think the totally sponteneous attack on Panagopoulos was so much a personal one as a structural one. Any union boss (ADEDY's included) would have been treated equally. Lets not forget that the previous GSEE president (and now PASOK MP) Mr Polyzogopoulos had been battered by protesters when his car accidently passed near an anti-fascist demo several years ago. The difference today is that GSEE cannot even put an official speaker at its own rally. And that's not because Panagopoulos has a salary of 170,000 Euros per year (when the proletarian annual wage is less than 10,000) or because he is a sold out scum, but because GSEE as such is considered as a sold out institution, as is ADEDY. Thats why during December its headquarters were occupied by workers holding some of the most populous assemblies during the uprising (of course not without its own problems, too complex to discuss in passim). Thus the discrediting of GSEE is not an issue of bad or delegitemised leadership, but of proletarian disgust at it as an institution, as a structure and as a social relation. This tendency is not to be confused with neoliberal stances towards syndicalism as a useless, protectionist, parasitic apparatus. The fact that in Serres we saw for the first time this year autonomous farmers unions is indicative of the change underway. I believe that the emergency is creating the conditions for the giant leaps mentioned above, leaps that have been brewing for a long time, but never found the environment or occasion to be realised. About the hatred against structures like GSEE, i have one more example: On 1st of May 2009, the gathering in Thessaloniki, had an autonomous block that was larger than the formal block of GSEE. When the spokesman went to speak, he came under attack with eggs and plastic bottles, was forced to stop his speach, and took the few protesters that followed him and went away. Many of the protesters that had came to the gathering of GSEE didn't go with them and came with the autonomous block that formed a demo in the streets of the city. "Also, this is the time where the State might very likely either manipualte a horrible terrorist attack - like in Italy in the 60s and 70s - from , say, "The Sect of Revolutionaries" or whatever - or let a bomb planted by more 'libertarian' sections explode and kill innocent proletarians by ignoring bomb warnings or arriving too late - this is what could happen if you rely on the State or the media to inform people of (self-defeating) bomb attacks. Regardless of whether anybody wants to discuss this here, this is something they should be discussing amongst themselves." I have to say that not all GSEE high ranking officials are soon expected to be PASOK parliament members and/or ministers - which is the absolute truth - see Kanellopoulos, Protopappas, Polyzogopoulos - but even left GSEE officials, such as those of KKE went and still going parliament members or at least candidates with KKE - see Mavrodoglou, Mavrikos and others. They have exaclty the same responcibility as PASOK ones in that thwe Greek syndicalist movement is doing actually nothing rather claping in favour of this and the other governmet. For me the attack agaisty panagopulos represents a healthy action, but it must not remail there. It must be a dynamic working class and social movement that it will be able to react and to mobilise quickly but effectively. Such a movement has to promote not "solutions" from within like the KKE alighned PAME does despite their recent occupations and spectacular actions, but to promote self-organisation, real and functional occupation of working areas etc. I thin k tha basis of such a movement is already exists and lies in those base unions which must expand in most of sections of the working class and organised federally. I absolutely agree with Dimitri, as the slogan goes "the self-organisation of the workers will become the grave of the bosses". It must be noted that clashes developed today between PASOK lackeys and protesters when the latter stormed the city hall of Volos in order to interrupt and cancel a talk by the Minister of Agriculture Ms Batzeli. Several people were wounded during the clashes. All people arrested during the Friday protest march have been released, with one of them having restriction to leave the country until his trial. Meanwhile judges and other courthouse employees have started a 2 hour daily stoppage against the austerity measures. Tax officers have also started a 48h strike against the measures. Today PAME allied workers marched to the parliament against the measures. A similar protest march took place in Salonica. Farmers in Serres have occupied a sugar producing factory protesting against agricultural products prices. In Athens the State Accountancy remains occupied with Panepistimiou street still closed by Olympic Airways layed-off workers. Refuse collectors in Athens have shut the main refuse depot of the capital until Thursday in protest against the new measures. Hey, first time poster, long time reader...I host a community weekly radical news radio show in Edmonton, Canada, and we pull many of our stories from Lib Com. I am wondering if anyone would know how I could get in contact with folks in Greece to perhaps do an interview for my show? Any help I could get would be greatly appreciated. Thanks in advance! hi, thanks for letting us know about the show and using our articles.